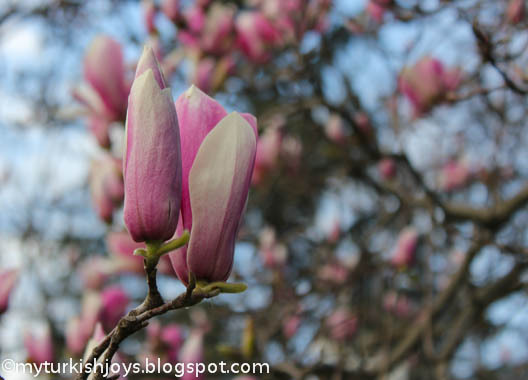 I’ve traveled from the European side of Istanbul to the Asian side and back again, and I’ve seen signs of spring in all its glory everywhere I look. Trees are blossoming with white and pale pink flowers. 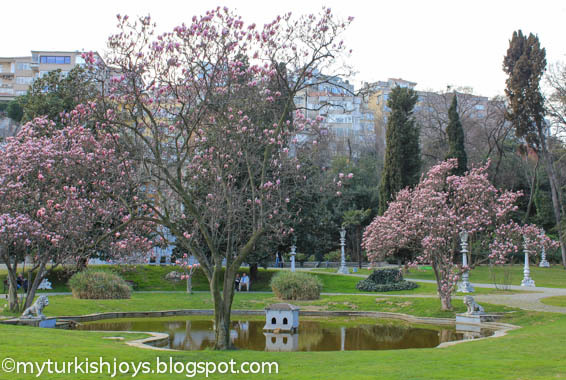 A few daffodils are blooming near the Dolmabahçe Palace. This park may be small, but it's a delight to walk through. That may be because we’ve had a fairly mild winter here except for a few snowfalls that blanketed Sultanahmet and the rest of the city as you can see in this photo post: Istanbul Covered in Snow in Instagram Photos. I love the flowers, but my allergies don’t. For the last week or so, I’ve had itchy, watery eyes and I’m often sneezing. Such is the price I pay for springtime beauty. I can’t stay cooped up in our apartment. The weather here really has been gorgeous with a little springtime rain here and there. 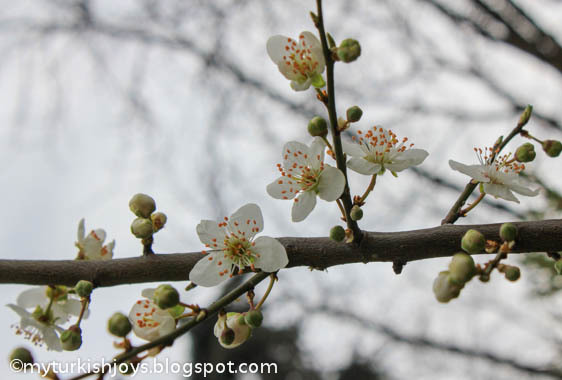 I’ll take the rain and early blossoms over snow any day! 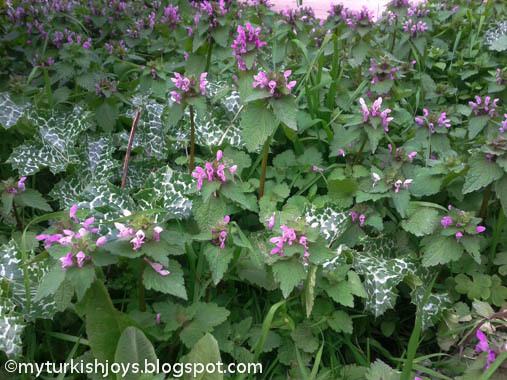 If you’re in Istanbul, get out there and enjoy spotting the flowers around the city like I have. A Turkish cat sunning herself against the vibrant turquoise background. 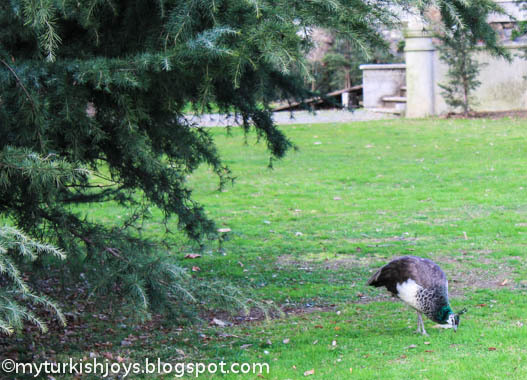 The peacocks have returned to the park in Beşiktaş. More lale blooms in the park. Purple wildflowers spotted around the city. 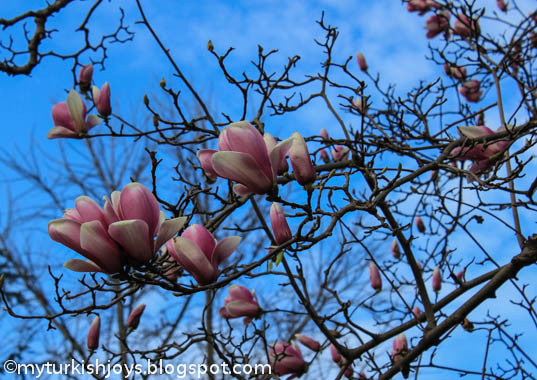 Great to know that spring has arrived here, and I love your photos. I think the tulips will be out soon too. Perhaps it's time for a visit to Ermigan Park. Lucky you, we're still getting more snow every day. I miss spring - and lighter food - sooo much!!! how pretty. that park is beautiful! we are having typical spring weather. 70 degrees yesterday and snow on the way today. @Elizabeth, are you not around right around? Well, when you return, I'm sure the lale should be ready soon. @Pille, Yes, we are lucky right now. Such a mild winter and hardly any snow. @Joyce, So strange! My parents in Nebraska said the same thing....such up and down temps. Hang in there! 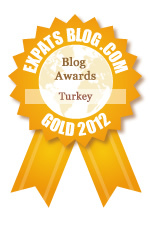 I saw my first tulips today too, on Barbaros Blvd. I can't wait to see Emirgan Park for the first time this year. I love the picture of the cat. I bet we see that picture bouncing around the internet in the next few weeks. @Karen, yay! I'll have to go check out Barbaros. @Alan, thank you! Love this park too. oh what beauty! would love to have a park like this in Beirut! 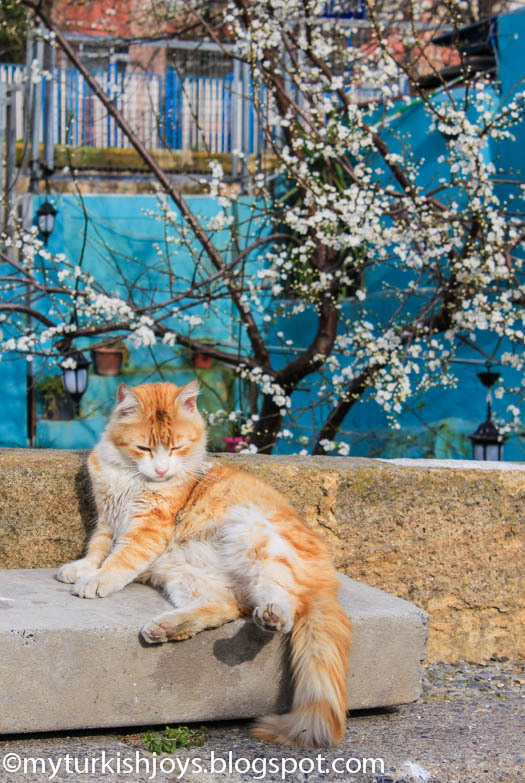 love the clic of the cat basking in the sun, so precious! @Westy, thanks for stopping by! I'll take a look at your musings. Cheers!